This is very cool. 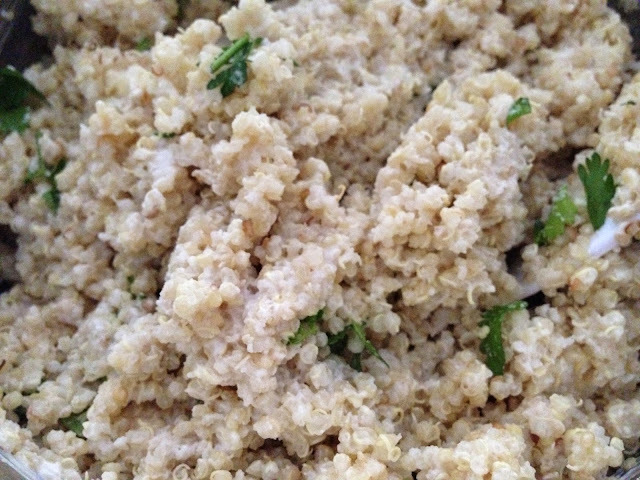 It's pretty "rich" tasting, which is great since quinoa can sometimes taste so "healthy". This is really good with just some pan seared white fish or any seafood honestly. I've had it with pan seared cod and with some lemony garlic shrimp. It's the perfect thing to have when you "can't" have carbs but need something rich that tastes like carbs. A little will go a long way. It's pretty darn filling...for Hubby and me anyway. Combine everything except the cilantro into a medium pot. Cover and bring to a boil. Lower the heat and simmer for 15 minutes. After the 15 minutes, turn off heat and let it rest for 5-10 minutes. Add in cilantro and mix to fluff up. Serve with seafood, grilled chicken, etc.